Is Noah Zarc responsible for the destruction of Earth... a thousand years before his birth? Noah Zarc rockets to Venus on a quest to discover the truth about his past. He refuses to believe his father is really the monster everyone says he is. Could there be valid reasons for everything his father’s done, including abandoning Noah at birth? Together with his two friends, a plucky girl from the Ice Age, and a street-wise kid from back alleys of Mars, Noah searches for answers to secrets everyone refuses to talk about — secrets that have remained hidden for over a thousand years. In the process he becomes embroiled in a mystery that could have devastating consequences. Could it be possible that Noah inadvertently caused the greatest cataclysm in the history of the solar system? 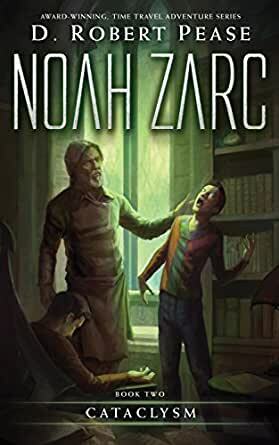 Will the name, Noah Zarc, be forever linked to the most devastating crime in humanity’s existence, all because he was in the wrong place at the wrong time? Race with Noah as he tries to stop the destruction of Earth, even if the enemy he needs to stop... is himself. I love this series for kids. My granddaughter and I are reading them together and enjoy the futuristic fantasy. The books deal with conservation...or lack of it...but doesn't get into extreme viewpoints one way or the other. The action moves along well and the characters are fun to get to know. Would recommend. Noah attempts to save the previously established Earth with lots of action and the story had so many surprises, turning everything around that you didn't really expect, attempt to figure out who is the good and/or the bad people. Noah and his friends are back at it, trying to save the world, well maybe the universe. Noah has strange dream and when he goes investigate them of course Haon is behind it all. Haon needs Noah's help to time travel, and only Noah can do it, and he needs to do it to save Earth. But what exactly destroyed Earth all those years ago to begin with is Noah's biggest question. This was another wonderful book by D. Robert Pease. It is exciting and fast paced, it will keep the attention of anyone. with the space travel and space time continuum it all sounds confusing but with Mr. Pease masterful writing everyone can enjoy the book. 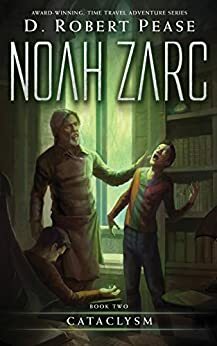 As Noah races to find out about his father, Haon, and his true intentions, not to mention save the Zarc name from one of the universes most horrifying events, but will it prove to be to much for a thirteen year old boy? If you ever get the chance David Radke is the narrator of audio version and he does a amazing job!!! Well worth the money on audible. 3.5 stars. Cataclysm is the second book in the Noah Zarc series. This can be read as a standalone, though it makes more sense if you have read the prequel and the first book. The next book has already been released so why stop with just this one? While this book and series is written for middle schoolers, adults will enjoy it too. At least this adult did. There is some violence. The book blurb adequately describes the storyline so I'm not going to repeat that all of that info here. The story, and series, is the SciFi version of the Biblical story of Noah and the ark. This book and the characters are well written. Noah, like many people, acts impulsively and does not think things through before he acts. This gets him into all kinds of situations. You could really feel his emotions and what he was going through. I will continue to read the more of the series to see what adventures he finds next. 5.0 out of 5 starsMore great adventures with Noah and his Crew! Once again Author D. Robert Pease has captured my sci-fi spirit with the continuing adventures of Noah Zarc and his family. As a Mom of three kids, one a strong-willed 12 year old boy; I still find myself wanting to put Noah in "Time Out" for some of his misdeeds and disobeying his parents though. Although Noah is a paraplegic and has to live his life in the modern space version of a wheel chair, he never lets this minor limitation stop him from living his life to it's fullest. And his parents and siblings don't treat him any differently due to his physical limitations. Noah's adventures show that no matter the physical issues, anyone can do what is right, save the day, or just plain have fun! Noah kept me interested throughout this mystery adventure with his determination to see his adventures through and "try" to do what he feels is the right thing to do. Though many times he ends up in more trouble due to his impetuous nature, I still find myself drawn into the story as I picture my own child and his adventurous spirit, traveling along with Noah and his crew. I can't wait to see what happens in the next book when it comes out in December 2013! *I received a free copy of this book for my review - regardless all my reviews are my honest opinion!